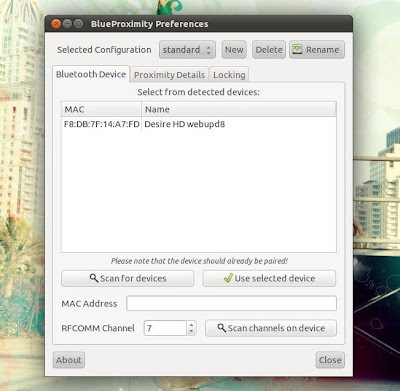 BlueProximity is an application that lets you automatically lock / unlock your (Linux) computer using a bluetooth device such as a mobile phone. You can configure the proximity distance (this is just an approximation because the signal strength is not always the same) and duration and when you move away from your computer, the screensaver is triggered and your computer is locked. When the bluetooth device (phone) is in range, it automatically unlocks the computer, without requiring any input on your side. This is useful for instance if you use Linux at work and want your computer to lock automatically when you leave for a few minutes, etc. Ubuntu 11.04+ only: Once installed, if you use Ubuntu 11.04 you need to whitelist BlueProximity so it shows up in the notification area (systray). If you want, you can whitelist all applications to use the Systray - see this post for details. If you only want to add BlueProximity to the already existing whitelist, use the steps below. Then reload unity (press ALT + F2 and enter "unity") or log out and log back in. You can then tweak the settings in BlueProximity Preferences but the default settings should be enough and your computer should now automatically lock when you move away from it. Don't worry though: if you forget your device, you can still unlock the computer by entering you password as usual. You can also pause BlueProximity by right clicking the icon on the notification area and selecting "Pause". Thanks to WebUpd8 reader Rodislav for the tip!